At this very moment a week ago, I was playtesting D&D Next and thoroughly enjoying it. As we made a hasty retreat from the legion of kobolds whose lair we rudely invaded (after realizing they had nothing to do with the caravan attacks our characters were hired to investigate and avenge), I loved the sheer fact we were running from kobolds. It was perhaps one of the greatest faults I’d always found with 4e, that sense of invincibility. Especially from kobolds. After getting our asses handed to us by an almost endless swarm of the reptilian bastards (to which the split movement rules made a significant difference), we knew the only way we could survive and face the actual threat of this adventure was to make a beeline for the front door. I knew today’s post would involve D&D Next, the tentative name for the 5th edition of the classic RPG. What I didn’t know was the exact topic would shift in less than 24 hours after ending our first session. Originally, I wanted to discuss the advantage/disadvantage rule of the game… until reading the Bounded Accuracy post on Wizards of the Coast’s site. During our playtest, I noticed there were no level-based attack bonuses for any of the pre-generated characters (especially the fighter, despite gaining an additional action at 2nd level). “Maybe there’s not bothering with that for the playtest right now,” I thought to myself. “There’ll be some in the next expansion, I’m sure.” Nope. 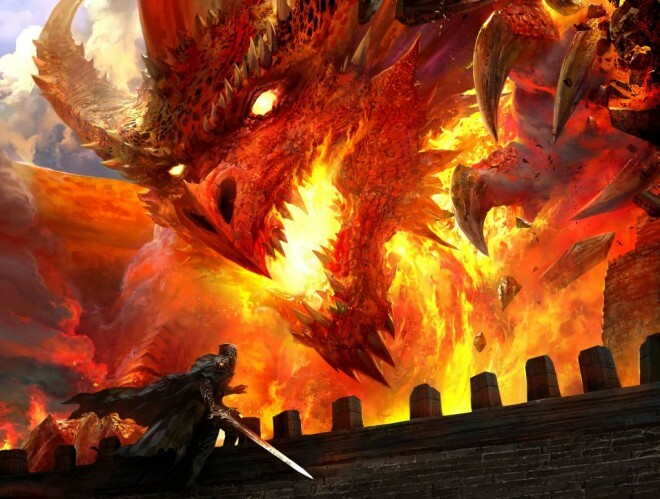 Those days of level increases to attack bonuses – one of the core values of not only D&D, but also many roleplaying and video games – are no longer part of the D&D glossary. What’s massive about this shift in modern D&D design is how they’ve left behind perhaps one of the greatest assumptions in RPG mechanics. When you list off all the core components of every edition of D&D in the past 38 years, you have Armor Class, saving throws, those six ability scores, and levels. The use of levels to gauge a character’s power and accuracy have been a fundamental part of the game’s design past two editions and mimicked in nearly every other form of modern gaming. It made perfect sense: the more experience you gain, the greater your chance to hit enemies. In time, those pesky goblins and kobolds are no match for your skills and you must expand your focus to battle the largest threats offered in the game. I’ve always had a problem with levels as labeling. Namely how players can easily translate their levels as a comparison of strength versus their enemy’s level to instantly translate just how tough a fight will be. For example, you’re a trio of 15th-level characters going up against a mess of 18th-level monsters. You instantly know this will be tough (and we all know the cardinal rule of remaining in the dark about monster strength was tossed out the window long ago – nearly every player is aware of every beast’s level in the game). It’s an aspect I’ve always chucked out the window. There’s no sign outside the wizard’s tower reading “Level 10-13 Adventurers Only Please.” Not that I would throw something twice their level at the party, but enemies and challenges were based on the story, setting, and current location. Doing so required some severe alterations in many cases and I always had to ensure there was a back-up plan available to the players in case my expectations were always too high, but it was a highly effective means of providing tension in my D&D games. To see this Next version of the game embracing this concept with such a twist in engineering is incredibly uplifting. The biggest provision the bounded accuracy system provides to any D&D campaign is applicability to the “weakest” creatures in the realm. Mainly, goblins and kobolds. Countless campaigns exist where these wicked minions run rampant throughout the land and act as a blight upon all civilized lands, yet they only interfere with the central characters’ lives for about the first quarter of the campaign. Sooner or later, they’re not worth the effort because you stand a 95% chance to hit them and this destroys their impact on a campaign. That’s like saying dragons are the scourge of all mortalkind unless you’re at least 10th level. Sure, those first ten levels look upon dragons with awe, fear, and anticipation, but then you’ve just demoted them to worthless trophies from 11th level and on or have to start creating more incredible, powerful versions of dragons in an effort to bring those emotions back to the fold. By that same token, it’s no different than every other major race in a fantasy world. Only powerful, mythological creatures from extraplanar worlds and similarly high-level villains offer a worthy challenge, but they don’t fit in this world you’ve built to incredible detail. The only place capable of housing such monsters exist away from the world or require some loophole storyline explaining why they haven’t simply walked all over the land and torn it asunder. In other words, creating a living, breathing world and keeping up with the power levels of your characters can make for some difficult pills to swallow. Every edition of D&D has taken great pains to allow story and character to exist in harmony, providing the heroes with a vast world in which to ply their trade and carry on their exploits. In phases. What bounded accuracy does is allow all the pieces to remain relevant for the entire campaign. That’s right, goblins and kobolds will always have a part to play because now they’ll always offer a challenge at every level. You just need to throw more of them into an encounter, that’s all. Without an increase to character probability every level (or every other level), there’s also no need for an increase to the difficulty required to keep every adventure a challenge. It’s always been a vicious circle: as the PCs ability goes up, so too does the difficulty number of every challenge. All that extra math extrapolated to guarantee the probability of a 1st-level character rolling against DC 15 was the same as a 15th-level PC trying to beat DC 30. There’s always been an issue with the previous method: individual character advancement. Depending on your class(es), your character would improve in certain areas, but at a different rate from the other classes. Fighters always gained an increase to their attack bonus, but not the wizard. Rogues had greater skill development and selection, not the barbarian. Eventually, the same problem would always persist. No matter what you did to boost your dice rolls, the difficulty would always keep up its original pace. It’s like trying to catch a race car with a shopping cart by choosing the right hill. Only by gaining certain magic items and benefiting from particular spells would you stand a chance to actually improve. It was an exercise in redundancy. That’s not to say your barbarian will now stand a better chance to become useful in skill checks, but the needless pursuit of gaining bonuses is over. Kicking open a locked door with DC 20 will remain the same challenge regardless of your level and that means any improvement gained will start to mean something. Those +1 bonuses will matter, even at the epic levels. So what’s the bother with levels then? For the results. At its simplest level, your attack rolls cause more damage with each level to represent what I consider a better equivalency of power. It makes sense, doesn’t it? If your precision improves with experience, shouldn’t your attacks and spells do more with every success? Think of all those times when you beat the monster’s AC and cause only 4 points of damage. When it comes to matters of combat, damage is where a character’s strength should truly lie in the same way it’s harder to ignore a spellcaster’s magic with every new level. Bounded accuracy keeps the game at its core and allows the designers to focus on what is well-known to be the central goal of D&D Next: creating an expansive system adaptable to individual player style. In other words, if you want to keep it simple, you can while working alongside other players simultaneously running more complex characters. Having incremental difficulty numbers would only complicate making this difficult goal functional. The irony of this new focus is how such a stray from one of the core pieces of the D&D puzzle has allowed the designers greater flexibility to create a variable game intended to invoke editions of old. It combines the original THAC0 spirit with modern dissociative mechanics to create a new version of the classic RPG rather than a rehash of a previous edition. And before anyone gets all fired up on whether or not they’re trying to fix something that’s not broken, let’s just enjoy this moment in online trolling when everyone stopped focusing on what’s best about the past and instead look towards enjoying the future.